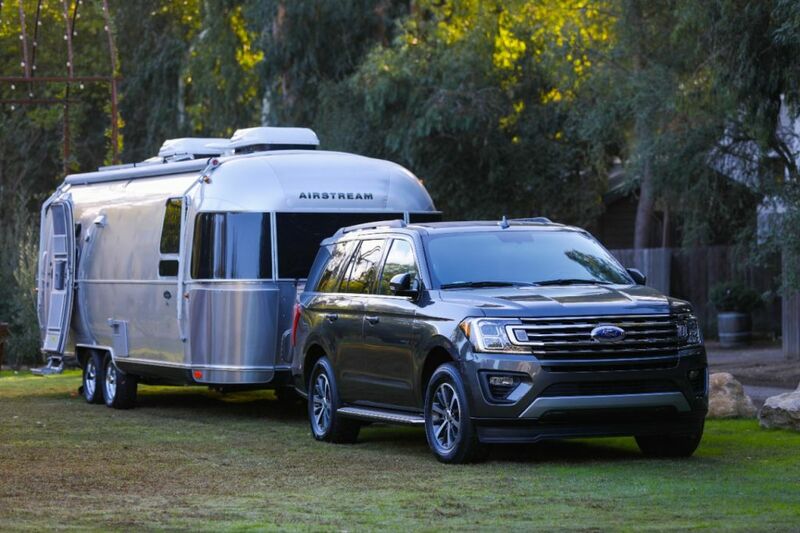 Ford introduces the all-new Expedition – the smartest, most capable and most adaptable Expedition ever – with technology to keep every passenger connected, more power for drivers, and more towing capability than any other full-size SUV. An all-new high-strength, aluminum-alloy body and redesigned high-strength steel frame form the foundation for Expedition’s rugged off-road and strong towing capabilities. Thanks to the use of advanced materials, the all-new Expedition saves up to 300 pounds, and the team reinvested that weight savings everywhere it counts to give customers more technology and convenience features than ever before. With its roomy, flexible interior, the all-new Expedition is the first full-size utility to feature a sliding second-row seat with tip-and-slide functionality, providing easy access to the third row without the need to first remove a child safety seat. Once in the third row, even adults will appreciate more legroom and reclining seats. Expedition’s available Wi-Fi hotspot supports as many as 10 devices at once – up to 50 feet from the vehicle – while an available dual-headrest rear seat entertainment system provides a next-generation video experience that allows passengers to watch live TV via SlingPlayer™ on either of two video screens. The system represents the first time SlingPlayer – which connects to a user’s home Slingbox™ account – is offered in an automobile. Powerful and efficient, Expedition’s new 3.5-liter EcoBoost® engine and 10-speed automatic transmission produce up to 400 horsepower and 480 foot pounds of torque with best-in-class fuel economy and towing capability. Expedition delivers 9,300 pounds of towing capability to the more than half of Expedition customers that value towing. It also features class-exclusive Pro Trailer Backup Assist™, making it easier than ever for customers to tow and haul with confidence. For those customers who like off-road adventure, Expedition FX4 Off-Road Package is the most off-road-capable Expedition ever. The package includes a patented electronic limited-slip rear differential, off-road-tuned shocks, all-terrain tires, seven different skid plates, unique 18-inch Magnetic Metallic-painted cast-aluminum wheels, chrome running boards, FX4 badging and new rubber floor liners. An all-new easy-to-use Terrain Management System™ lets FX4 customers select from seven special drive modes that help Expedition automatically adapt to different road conditions. This includes normal for around town driving, sport for more spirited trips, tow/haul for improved towing and hauling performance, eco for enhanced fuel economy, grass/gravel/snow for loose terrain, sand for low traction situations and mud/rut for uneven surfaces. Expedition FX4 drivers also can manually select either 2WD or 4WD modes in a given drive mode, depending on their preferences and terrain. The all-new Expedition is available in XLT, Limited and Platinum series. In addition, an XL version is available for fleet customers, from law enforcement to emergency services. To help customers choose the right amount of interior room for their families, all series are available on the extended-length Expedition MAX. The all-new Expedition is heading to dealer showrooms and is built at Kentucky Truck Plant in Louisville, Kentucky.